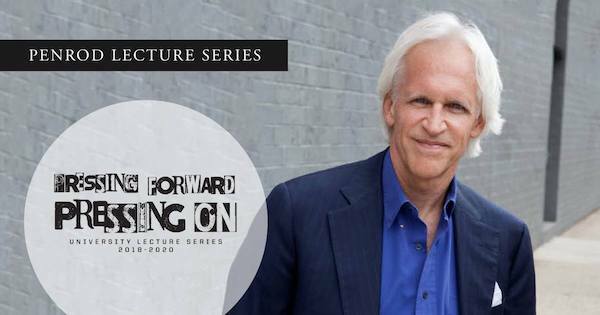 The Mission Matters this month is a review essay of a pair of books by Robert Edsel, the author of “Monuments Men.” Edsel will be on campus at 7:00 p.m. on Thursday, March 28th as part of this year’s University Series Pressing Forward, Pressing On. You won’t want to miss this event! As many people know, I enjoy recommending books to others to read, but I am even more grateful when people give me reading recommendations. 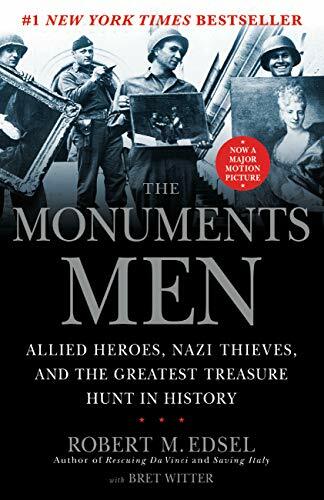 In particular, I am glad that Katherine Fries proposed that Robert Edsel give the Penrod Lecture because it gave me an excuse to read Monuments Men: Allied Heroes, Nazi Thieves, and the Greatest Treasure Hunt in History (2007). 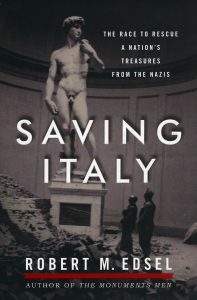 Just about the time I finished reading that fine book, I heard about Edsel’s next book Saving Italy: The Race to Rescue a Nation’s Treasures from the Nazis (2013), which is more like a “prequel” to the first book than a sequel in the usual sense. After reading these two remarkable books, I decided to write this review essay for this month’s Mission Matters because the book invites further reflection about what it means to be stewards of cultural treasures and/or intellectual traditions. Edsel’s initial interest was piqued by his discovery that the identities and achievements of the “Monuments, Fine Arts, and Archives” (MFAA) section of the Western Allied military force during World War II were virtually unknown. At different times, more than 350 men from 13 nations served as “Monuments Men” from 1943 to 1951, but at the end of combat in 1945, there were only 60 men serving in Western Europe. Most were British and Americans. They “didn’t carry machine guns or drive tanks,” but in many cases, the Monuments Men worked alongside military service personnel who were using weapons, and they could only do their work by respecting military authority. Many – but not all – of the stories are dramatic accounts of heroism that took place in France, the Netherlands, Germany and Austria from June 1944 to May 1945. Perhaps the first thing potential readers of Monuments Men need to know about this remarkable book is that Robert Edsel is the kind of storyteller who is not content with telling the obvious. He wants to get the story behind the story. For example, he goes to great lengths to reconstruct what the German military leaders (at various levels) were doing at the time that the Monuments Men were protecting and/or saving works of art like the Ghent Altarpiece and the Bruges Madonna. And because he is persistent in his explorations, readers of his remarkable book Monuments Men learn much more about how a group of art gallery curators turned military men stopped “the greatest looting operation in the twentieth century.” (71) So much so, in fact, that I found myself wanting to explore side-trails one might enter from the main path of Edsel’s narrative. Another feature of the story is that Rose Valland comes from an undistinguished background. She is not from one of the first families of France. She has a limited education – not from the Sorbonne but from a regional French university. In the world of art collectors and museum directors, she is treated as little more than a clerk at the Jeu de Palme museum where she continues to work as a volunteer during the war years. “Madame Valland is reluctant to turn over all her records and information.” (161) Edsel does not go into all the details about this part of the story, but one can imagine how uncertain Rose Valland would be in such a circumstance. Could she trust this man — this American, this military figure — to protect these remarkable works of art? Eventually, James Rorimer gains her trust and she passes on the meticulous records she had kept about what works of art had been stolen and where the Nazis had shipped them. Thereafter, Rorimer and the other “Monuments Men” race to various locations in Germany and Austria where the Nazis have hidden the paintings and sculptures. In the closing days of the war, the Americans rescue most of the art before the Nazis can carry out plans to destroy all the non-German works of art and before the Russians can capture the stolen art to avenge their own losses and cultural destruction at the hands of the Third Reich. At the end of Monuments Men, Robert Edsel recounts what happened to the various figures in the book, many of which had been forgotten until he began gathering their stories at a point where these men were at the end of their lives. I was particularly interested to learn what happened to Rose Valland – a curiosity that I suspect many readers share. After the War, Rose Valland spent another six years helping to track down the stolen treasures. Despite such remarkable achievements, Rose Valland would continue to be overlooked. Not until the mid-1950s would she finally be granted the title of “curator” at the Jeu de Palme museum. In due course, Rose Valland was honored by both the French and American governments for her selfless efforts to save thousands of works of art. But because she took the calculated risk to give the information about the stolen art to the American military officer, many French citizens regarded it as “a breach of protocol bordering on unpatriotic.” Many others “came to resent her for her relentless pursuit of information about the Nazis and restitution of stolen art.” At a time when many people want to forget what had happened in France (Vichy regime), Rose Valland “would never forget and would never let it rest.” (413) This woman raised too many uncomfortable questions for her fellow citizens to embrace her wartime efforts to preserve cultural treasures. As Edsel suggests, in addition to the thrilling story about how 22,000 pieces of art that had been stolen from French collection were saved, this is not only a story about how a determined woman working with the French Resistance prevails against the Vichy regime and the German occupation forces but also how she confronts other formidable foes including sexism, classist elitism and the national pride in a country where people continue to find it difficult to talk about Vichy collaborations with the Nazis. Clearly, Edsel (as a privileged white male from the USA) is haunted by these storylines, as am I. With these additional dimensions of the story of the life and work of Rose Valland in view, I invite readers to consider the second set of related narratives that took place several years before the incidents in Paris in other locations in Europe where Monuments Men worked alongside other stewards of local treasures. In this context, Robert Edsel also takes the time to spell out more of the “back story” of European resentment about German displays of cultural superiority, particularly with respect to the destruction that took place in World War I. As Edsel is careful to explain to readers, both the United States and Germany took steps to protect cultural treasures during World War II. In both cases, the reason why had everything to do with what had transpired during the first World War. In particular, what transpired at the University of Louvain was a matter of infamy, which had been decried around the world. For all of these reasons, the destruction of the Louvain library “became a notorious example of wanton wartime destruction.” (Saving Italy, 69) Indeed, it became a symbol of collective responsibility for the intellectual heritage of the European past that led to widespread participation. The effort to rebuild the Library at Louvain took more than a decade; it did not re-open until 1928. Given what had transpired in 1914, one would have hoped that the German military forces would have gone out of their way to avoid destruction of university facilities. However, as Robert Edsel explains, no such restraint was shown by the Germans at the outset of World War II. The challenge, then, is for readers to think the “unthinkable” – to consider what it means that not only did this take place, but that it took place in a time and place where people were carrying out the mission of higher education. That is where Robert Edsel has to leave the story of the Library of the University of Louvain. His purpose in this instance is rightly limited to explaining why Allied suspicions of Hitler and the German military were justified – and in some cases eerily accurate — in their identification of the most likely targets for destruction. However, there is more to the story if you are the kind of reader who is curious about what faculty and staff at universities did during and between the World Wars to protect the scholarly treasures, particularly with respect to libraries and archives. Before the Second World War, it is possible to find examples of the ways that university personnel acted to preserve and protect works of art as well as monuments. And in the wake of World War II, some of the Monuments Men returned to positions at colleges and universities where they taught the next generation of artists, art historians, and curators/directors of art museums. In my judgment, these are is the kinds of stories that we as faculty and staff colleagues at the University of Indianapolis need to know and be able to tell, and that is what I propose to do in the remainder of this review essay. As it happens, four years ago this month, I had the opportunity to visit the University of Louvain in 2015 while my wife and I were traveling in Belgium. I already knew a few things about this historic community of learning. For example, I knew that Louvain was the site of one of the oldest Catholic universities in Western Europe. I also knew people, like my friend Paul Gabonay (who formerly served as UIndy’s Director of Career Services), who had studied at Louvain in the 1960s and 1970s. I had another set of reasons for wanting to visit the University of Louvain/Leuven. I have long admired the Christian Humanist scholar Erasmus of Rotterdam (1484-1536), who famously went around Europe and consulted the various manuscripts of the Greek New Testament in order to put together an accurate translation of the Bible into Latin. Later, I learned that Erasmus had proposed to reorganize the University around a trilingual curriculum where students and faculty would be literate in Greek and Hebrew as well as Latin. Before we went to Louvain, I was able to visit his home on the edge of Brussels. While in Louvain, we had the opportunity to visit the site of the commune in Louvain associated with the Brotherhood of the Common Life, and we saw the fascinating community of women known as the Beguines, local sites that for decades have attracted inquiring tourists eager to learn about treasures of European history. While in Louvain, I also stopped to visit the library, which I had heard was a very impressive facility. To be honest, though, until that point I had only a vague awareness of the dramatic destruction of Louvain during the first and second World Wars, but my knowledge was limited, to say the least. I spent the afternoon exploring various exhibits, which tell about the story of the destruction and successful efforts to rebuild the Louvain Library (between 1915 and 1928) as well as after World War II. The remaining tower of the library includes exhibits about the destruction in 1914, the rebuilding that concluded in 1928, and the subsequent destruction in 1940. I quickly realized that I would not be able to do justice to all the exhibits, but two, in particular, grabbed my attention. I spent the rest of the afternoon learning more about the intellectual traditions of the University of Louvain. One of the exhibits deals with a remarkable statement by a group of German intellectuals who wrote a statement defending Germany against the charge that they were responsible for the destruction of the Louvain Library. In part, this statement shifts responsibility to local authorities (as if they could have prevented the destruction), but what is even more remarkable about the statement is the assertion of what amounts to German exceptionalism – namely the contention that Germans have a higher appreciation for art that other cultures do. The statement of the Committee of 93 German intellectuals appealed to “the nations of the civilized world” to remember that the German people prize scholarship and the arts: “Have faith in us! Believe, that we shall carry on this war to the end as a civilized nation, to whom the legacy of a Goethe, a Beethoven, and a Kant is just as sacred as its own hearths and homes. . . . For this we pledge you our names and our honor.” The fact that the names and examples of cultural treasure that were used in this statement were exclusively German may have been self-satisfying, but the statement only succeeded in persuading British, French, and Belgian leaders that the Germans did not respect the wider cultural inheritance of Western Europe. The Librarian of the University of Louvain stipulates the most obvious effects of the destruction. “The burning of the Library of Louvain has caused two irreparable losses: the loss of a historic monument: a gem of the most beautiful architecture of two distinct periods – the fourteenth and the eighteenth centuries – and the loss of the collection of manuscripts, books, and relics of the University of Louvain.” He went on to provide an even more detailed account of what had been lost. Proceeding roughly in chronological order, Prof. Delannoy described the library’s holdings in the context of the university’s history, which began in 1432. He began by describing the 500 original manuscripts, many of which were illuminated, which included a prized volume of sermons “written by the hand of Thomas à Kempis.” He explains that Louvain also was one of the centers of the introduction of printing into Belgium, and the library had a rare collection of incunables (some of the earliest printed books 15th century), which included the capacity to print in all three languages: Latin, Greek, and Hebrew. The University of Louvain also was a center for interpretation of intellectual conflicts, which not only pertained to the history of Belgium but included the role played by the Catholic Faculty in Theology in disputes with Martin Luther among other Protestants. In addition to such Reformation-era doctrinal conflicts, the library’s collection included original copies of books and papers about disputes of Prof. Jansenius, a scripture scholar at Louvain, with Jesuit opponents, and a special archive of documents pertaining the controversy over “the heresy of Baianism.” As Professor Delannoy lamented, the library staff was preparing to publish catalogues of all these treasured rare books and archives of texts when they were destroyed by the German soldiers. Given Prof. Delannoy’s adamant determination to hold the German intellectuals (and by implication their government) responsible for the destruction of the cultural treasures in the library, it is all too easy to overlook the other two avowals of this remarkable statement. The first statement could only have been heard as an expression of bravado given that there would have been little or no basis for “the halls of Louvain” to re-assert the kind of institutional capacity to carry out the university’s mission in the fullest sense. The second avowal, which enlisted the community of nations around the globe in the cause of avenging the loss of the Louvain’s “intellectual and artistic patrimony,” also lacked – at least initially — the kind of agency that would make this a realistic goal. One could easily imagine how both of these efforts could have fallen flat, like so many other invocations of the ancient image of the phoenix rising from the ashes. But that did not happen. In addition to the German government’s eventual payment of reparations to replace 200,000 books in the library, contributions from around the world helped rebuild the Library at the University of Louvain. Even high school and college students in the American Midwest raised more than $100,000 to restore Louvain’s library! These are the additional stories that I found myself fascinated to discover – narratives that are not part of Edsel’s agenda to tell as part of the saga of the Monuments Men — but which I think it is important for readers at a university like ours to take the measure of the example of the University of Louvain even while enjoying the adventure story of the Monuments Men bringing out priceless paintings from the places where they had been hidden by the German military on the orders of Adolf Hitler and Field Marshall Herman Goering, the supreme commander of Germany’s military forces. The same day that I was visiting the University of Louvain in March 2015, I also saw an exhibit about the work of the philosopher Edmund Husserl (1859-1938), whose writings about the “phenomenology of the body” and “transcendental consciousness” were controversial during his lifetime and remain so in many quarters. I am not embarrassed to say that I have never understood Husserl’s philosophical writings. Even so, I know Husserl’s work has been used by scholars who I have long admired, philosophers as different as James Sheridan and Dallas Willard. Husserl was one of the figures who stood in the crossfire between the intellectual communities associated with English-speaking philosophy and the Continental philosophy associated with German-speaking intellectuals. The conflict was so intense that the word Kulturskrieg (trans. “culture wars”) has been used to describe the mutual antipathy that developed between scholars in England and Germany during the period before World War I. The destruction of the University of Louvain was viewed by the British (and American) scholars as further evidence of the reprehensible views of German intellectuals, and groups like the “Committee of 93” bristled at being shut out of academic conferences and symposia because they professed different convictions. Before I go further, I need to mention that Edmund Husserl was not listed as a signatory of the statement of the German “Committee of 93” (discussed briefly above), nor is there any record that he spoke out against that group’s justification of the destruction of Louvain’s library. We may never know the full story of his experience as a Jewish scholar living during the interwar period in Germany. I assume that life must have been very complicated for him, and it appears that it became more so after World War I, when his work became suspect from both sides of the Kulturskrieg. Some British philosophers thought that his work was part of a revolution against German Idealism. Others took his claim that what he was doing was “transcendental idealism” as the confirmation of their worst fears that he saw himself as following the train of Immanuel Kant and G.F.W. Hegel. German-speaking philosophers and scientists also questioned the value of his work. When Husserl gave a series of lectures at the University of Cambridge in 1922, he was the first German-speaking intellectual to be invited to give lectures in England since the end of World War I. The lectures were regarded as “a fiasco,” simply confirming the sense that the “culture wars” between the Analytic tradition of philosophy and the Continental tradition would continue for years to come. Husserl died in 1938, leaving a small mountain of documents and manuscripts, some of which were finished and others of which existed only as drafts at the time of his death. Today, scholars writing dissertations on Husserl are likely to make their way to the University of Louvain. The Husserl-Archives at the Institute of Philosophy (Hoger Instituut voor Wijsbegeerte) at the KU Leuven (University of Leuven) is a world-renowned center for scholarly research in the field of phenomenology. As the dual name implies, this facility is multi-lingual. Francophone, Dutch, and German scholars commingle with English speakers studying Husserl’s contention that “transcendental” consciousness sets the limits of all possible knowledge. I remain impressed by the actions of Fr. Van Breda and his colleagues at the University of Louvain. Without their efforts, the lifework of Husserl might have been lost. And given the controversies around Husserl’s philosophy, some people would have likely rejoiced at that prospect—either as some kind of nationalistic desire for revenge against German scholarship (however misapplied) or out of a more specific hatred of Husserl’s philosophical project. I wish that I knew more about how they accomplished this feat in the months before World War II began. I have to wonder how van Breda thought of this project in relation to his vocation as a member of the mendicant order of St. Francis. Perhaps he thought of it primarily in terms of what it could do for the University of Louvain and not for himself. I would also be curious to know if Fr. van Bredt recalled Prof. Delonnoy’s emotional avowal that Louvain’s library would “rise again” when he arranged to bring Edmund Husserl’s papers to Louvain where they have been studied and engaged by a variety of philosophers and scientists. Perhaps not. It is quite possible that this effort was not even noticed given all that was going on in Belgium and elsewhere in the months prior to German’s invasion. Like the story of what Rose Valland did at the Jeu de Palme Museum in Paris, this is a story that is easily forgotten, unless someone like Robert Edsel conceived a project that gathers stories about how cultural treasures have been saved. Or unless someone associated with the university where van Breda did his work takes the time to put together an exhibit that tells the story of how this particular feature of the university’s intellectual tradition came to be. In other words, he has institutionalized the project; he has created a museum and/or an archive. In sum: Edsel and his colleagues have developed a mission that exists alongside other educational ventures – like colleges and universities – such as the University of Louvain and the University of Indianapolis. Even as I cheer the efforts of Robert Edsel to celebrate the dramatic story of Monuments Men and to carry out their unfinished mission, I confess that I worry about what seems to me to be another danger — that we will overlook the not-so-dramatic work of colleagues at our own university who have already embraced the tasks of protecting, preserving, and perhaps even “saving” monuments, film, and artworks. Here I would invite you to pause to think about the persons you know who carry out this work from day to day and year to year, decade after decade. One of the reasons why it is important to bring their faces to mind is because these are the persons who make it possible for us to name the intellectual traditions for which we are known as a university. And, we might add, based on the foregoing account that I have offered, the University of Louvain is the institution where a Franciscan priest saved the life-work of a German-speaking philosopher named Edmund Husserl after its library had already been destroyed in 1940 by the German military and suffered the indignity of having German intellectuals speak out in justification of the German military’s actions. In other words, it is a university that has an intellectual tradition that is sufficiently broad and deep to embrace these kinds of endeavors. Whatever else we might want to say then, the mission of a university includes taking care of cultural treasures. This is no less true of the University of Indianapolis than it is of the University of Louvain, although it is tempting to think that intellectual traditions are easier to identify when an institution has ancient origins, like the University of Louvain, which was founded almost 500 years before UIndy. To be sure, Louvain has a longer history than ours, but if you take the time to learn more about this European “comprehensive” university, I think you will find many commonalities along with salient differences. The more I saw and the more I learned while visiting Louvain Library in 2015, the more impressed I was at this remarkable community of learning, which as the values statement indicates, has its own ecumenical Christian tradition as well as secular strands of intellectual history. What I have learned is that the story of Louvain is not simply about the tragedy of what had transpired in 1914 and 1940. The story of this University located a small city in Belgium is also about the ways that the faculty and staff at the University of Louvain have incorporated this history of destruction into their own multi-stranded intellectual tradition and extended that rich and complex heritage in new ways. This storied institution is a treasure to be cherished by people near and far. Speaking of treasures, I have a couple of books that I think you will want to read! If you come by my office, I will show them to you. As always, I invite your feedback at missionmatters@uindy.edu. In the meantime, thanks for taking the time to reflect with me.